In the country there are horses and cows. To keep them from roaming all over the country owners put up fences, mostly barbed wire. Still, sometimes the livestock find their way out. We’ve awakened to a very large mama cow next to our front porch. Or had to slow our car down to wait on a couple of horses to get out of the way. The fences aren’t perfect. A post will break, the wire will rust, a gate will be left open. And sometimes a curious bull wants to taste the grass on the other side and will find his way through. But mostly the fences do the job. Thank you. I love the dew drops on the spider web. Great shot! I love how you got the spider web in there. From up close we can see why it’s effective. Beautiful photo Marie 🙂 Great how the cobweb is caught on both the top and bottom barbs, and highlighted with the mist droplets. I find the image quite evocative!! Thank you so much. That morning there were so many spider webs along the fence line and highlighted because the dew had caught on them. It was beautiful. 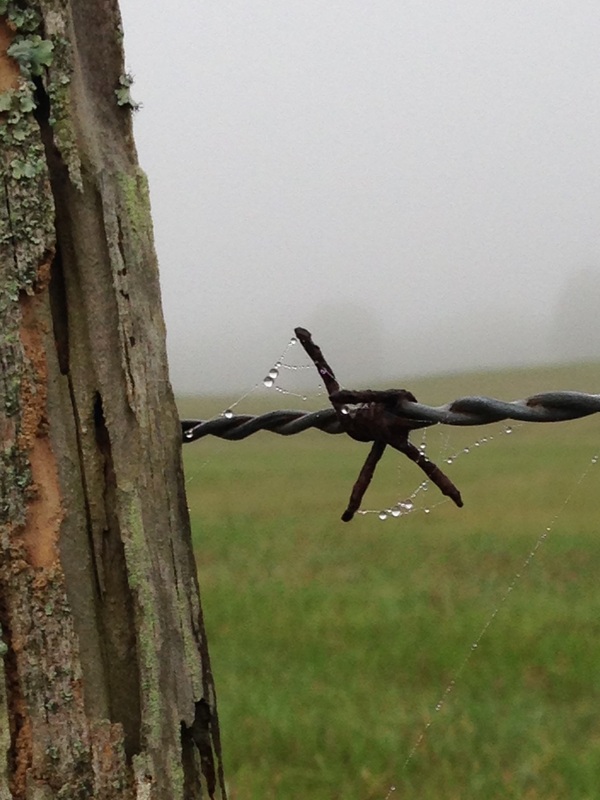 great shot – I tried a close up of barbed wire earlier this summer – NOT easy – good for you! Beautiful photo! And this would make a really good allegorical post about personal boundaries! Great shot! The dew drops are beautiful! Thank you Laura! This is one of my faves.